May 06, 2016 - "Press Releases"
Vecoplan LLC, a manufacturer of industrial shredders and recycling systems, has updated and launched a new version of www.vecoplanllc.com. The new site automatically formats for laptops, tablets and mobile phones. 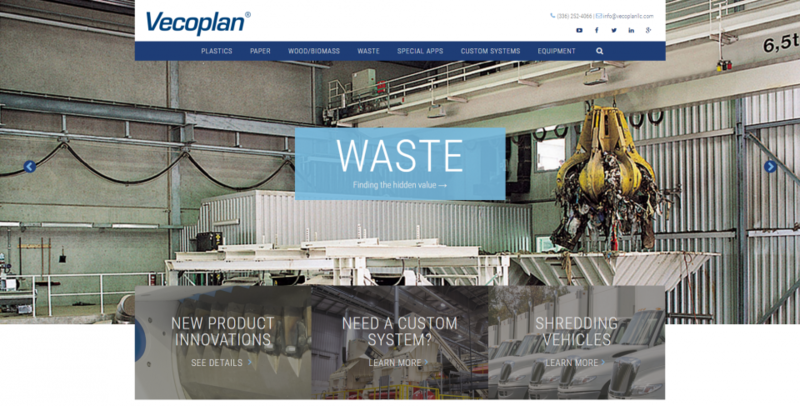 The site begins by highlighting markets served by Vecoplan including: Plastics, Paper, Wood, Biomass, Waste, Special Apps, and Custom Systems. Enhanced search features throughout the site provide in-depth information but in a concise format. The site also provides downloadable literature on Vecoplan’s products & services, links to Vecoplan’s YouTube channel, blog & other social media, a virtual sample room containing before and after photos of shred tests on a spectrum of materials, details on how to set-up a test on your specific material, and features a contact link on all pages.